A gentle introduction to the classic practice of Hatha Yoga . Breathing exercises (pranayama), bandhas (closures), meditation and chakras . We start our lessons with a short meditation and breathing awareness exercises before we move on to the asana practice . The asana practice as well is containing various elements of pranayama. Mela adjusts the exercises to your level, so you will be neither over- nor under-challenged. The correct running of the position, breathing and meditation are of central importance. The morning classes are more dynamic and sun oriented. The lessons in the evening are dedicated to the silence, the moon and the interior. No yoga on arrival and departure days. 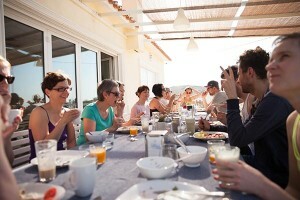 On arrival day we will be waiting for you with dinner, on departure day we will have the last breakfast. On Wednesday you will have the chance to explore the surroundings, such as Nerja, Málaga and even Granada. 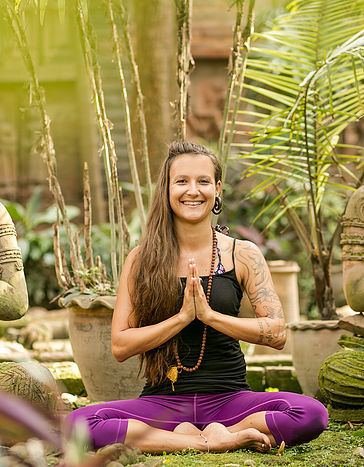 Mela is a yoga teacher, holistic nutritionist and nurse from Switzerland. As a certified yoga alliance teacher she offers classes, workshops and retreats all over the world. She has studied various styles of yoga from Ashtanga to Vinyasa and lived in spiritual communities throughout Asia. Her main practice is Kundalini Yoga. It utilizes unique combinations of Asanas, Mudras, Bhandas and Pranayama. As a nurse Mela has always been interested in health, anatomy and bodywork. She has completed a diploma in holistic nutrition and taken courses in Reiki, Chi Nei Tsang (Taoist abdominal massage) and recently completed a Rebirthing training with Leonard Orr. Mela loves exploring various forms of bodywork in her daily life. She finds her joy in dance, acrobatics, breath-work and singing. She is passionate about using her voice with mantras, playing harmonium and offering space for bhajan. As a teacher she endeavors to share her abundance in a fun and transformative environment. In her yoga and partner-acrobatics classes students will explore the depths of breath, trust, touch and an awareness of their whole body.